Forrest Services endeavors to maximize the efficiency of a planner using GIS and Remote Sensing. GIS is a process of data collecting, transforming, analyze and displaying in a system to care for customers requirements and believe in client satisfaction. 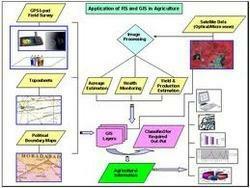 GIS and Remote Sensing can answer the vital questions like pattern, condition, trends, modeling and location of any region under scan. It assimilates data from diverse resources and evaluates the referred information, analyzes it and evaluates the changes after development. It manipulates the space, patterns and conditions to attain qualitative objectives quickly. It allows the user to understand the spatial information by specifying queries. We integrates the power of GIS and remote sensing with subject matter expertise to implement powerful spatial technology solutions. We have built an organization comprised of skilled professionals and top-level technical and administrative personnel with a wide variety of GIS and Remote Sensing resources. These resources enable us to develop and implement innovative long-term solutions to the complex problems of our clients. We endeavors to maximize the efficiency of Transportation, Telecommunication, Mining, Tourism, Municipal, Utility sectors, Automotive, Real Estate and Retail sector etc by the use of GIS and Remote Sensing techniques for decision making and planning, by Collecting, integrating information from different sources.